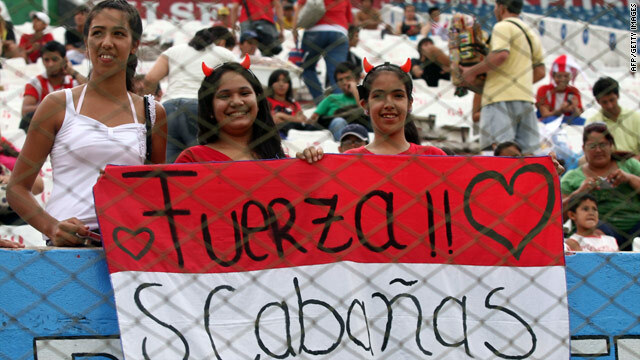 Fans show their support for striker Salvador Cabanas after he was shot in the head in Mexico City on Monday. (CNN) -- Salvador Cabanas remains in a critical condition in hospital as doctors admit they are having difficulty treating the Paraguay international due to increased swelling on his brain. The Club America striker was shot in the head in Mexico City during the early hours of Monday morning after an incident in a city bar. Cabanas was transported to an intensive care unit at a local hospital and was rushed into theatre where doctors made an attempt to remove the bullet lodged in his skull before deciding it would be too dangerous. Doctors revealed he showed favorable signs when they attempted to bring him out of an induced coma but have now been forced to increase the sedation as the swelling on his brain worsens. "Salvador remains clinically stable, nevertheless we have had certain problems because the excess accumulation of water on his brain has grown," Ernesto Martinez Duhart, who operated on Cabanas, told reporters. "We will have to keep him sedated a bit more to protect and improve cerebral function. It could get worse, he continues to be in the same serious condition. The risk of death has not yet passed." Cabanas is one of Paraguay's top players and was part of their World Cup squad in Germany four years ago. The 29-year-old is a prolific goalscorer and was expected to lead Paraguay's attack in South Africa this summer. He has scored over 100 times in the Mexican top flight and has netted 18 goals in 24 matches this season. Around 10,000 Paraguayan fans gathered at the the Estadio Defensores del Chaco, the country's national stadium in Asuncion, to hold a vigil for Cabanas on Tuesday evening.